Nearly 40 Associated employees in Green Bay, Fox Valley, Madison and Milwaukee donated over 200 volunteer hours out of the office to participate in Habitat for Humanity builds over a one week period that started July 14. This statewide build week may be the first of its kind for Associated and Habitat in Wisconsin, but it’s certainly not the first time Associated’s employees have stepped up to help Habitat for Humanity provide simple, decent affordable housing for Wisconsin families in need. 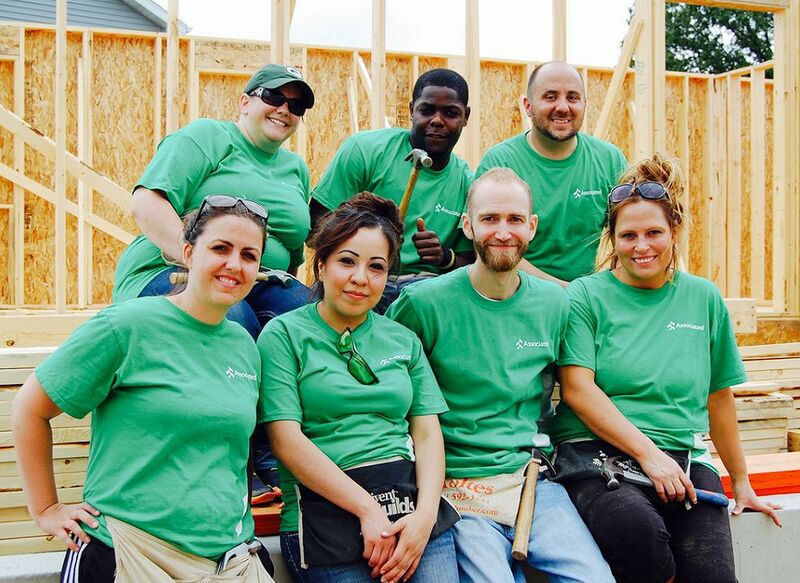 "Associated bank and its employees have had a longstanding relationship with the Greater Green Bay Habitat for Humanity, both in volunteering, mentoring and board participation,” said Cora Haltaufderheid, executive director, Habitat Green Bay. “Last week they participated on two homes in Green Bay, assisting with drywall and other building tasks. We always look forward to seeing them out on our build sites." In 2014 alone, Associated staff volunteered over 650 hours for Habitats in Wisconsin, from swinging hammers to serving on local Habitat affiliate boards. The bank has also purchased residential loan mortgages from Milwaukee Habitat in 2015 for $2 million, and from Greater Green Bay Habitat in 2014 for $1.08 million – totaling over $3 million. This effort was coordinated through Associated’s “Colleague Resource Groups,” teams of individuals who have a common interest or background in areas of recruitment, development, social and community based efforts. Photo caption: (Front row, left to right) Ashley Adleman (Janesville Pick-n-Save), Eddie Aguero (Sun Prairie Cops), Eric Borcherding (Sun Prairie Grand), and Shonna Meyers (Janesville Lexington). (Back row, left to right) Melissa Sweeney (Windsor), Eliseo Lacossiere (Whitney Way Copps, and Mike Niedermier (Northport).